The subject of assistance with daily activities can be a difficult subject to broach, but when a senior is suffering from a mental health problem such as bipolar, dementia or depression, the topic can become even more sensitive. According to the Institute of Medicine of the National Academies, approximately 14 to 20% of seniors have one or more mental health issues. For these seniors and their loved ones, in particular, agreeing to hire a home care agency can be a difficult decision. If seniors are not open to the idea, they may become easily agitated or show increased symptoms of depression – in turn causing additional stress for family caregivers. As a whole, family caregivers of seniors with mental health issues are encouraged to seek support in managing the care of their loved one. Fortunately, agencies equipped with the power of a homecare software or homecare system, like ClearCare, can provide an incredibly helpful hand in keeping seniors with dementia, depression or other mental health issues, safe and happy at home. Often, family caregivers and seniors may be concerned about finding a caregiver that meets their care needs. Do they have experience with seniors with dementia? Will they follow the daily routine? Can they assist with transportation? Agencies using ClearCare’s homecare software and homecare system have the power to answer these questions in an instant – creating quick caregiver matching based on criteria that’s most important to clients and their loved ones. And, if a caregiver doesn’t work out, a homecare system is a reliable way to ensure that the right caregivers are always on staff. Another major concern for family members can be knowledge of what happens when a caregiver is with their loved ones. 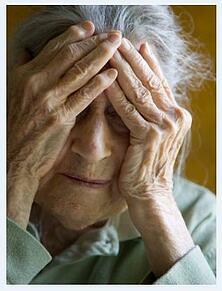 Tracking mood and routine for senior with mental health issues can be especially important. With ClearCare homecare software and homecare system’s robust task management features and family log-ins, loved ones can receive real-time updates on the day of their loved on via secure log-ins to the homecare software. With that in mind, letting caregivers know a senior’s daily routine can be just as important. While paper care logs can work, using a homecare system equipped with telephony allows caregivers to hear updates to tasks in real-time, ensuring that any required changes can be worked in at a moment’s notice. Additionally, caregivers using a smartphone or tablet in the field can have access to a client’s assessment via ClearCare’s homecare system – giving constant access to important notes. Managing the care of a senior with mental health issues can be especially challenging for family caregivers, but with the help of a private duty agency utilizing a homecare software such as ClearCare, care management can be streamlined and supported with quality caregivers and dependable technology.